BLACKSBURG, Va. (AP) Kelly Bryant left Virginia Tech defenders grasping at air, laying on the ground and wondering how they’d missed him. And they missed him plenty, and No. 2 Clemson has three victories against Top 25 programs engineered by its new quarterback. Making just his fifth start, the junior ran for 94 yards, hit Tavien Feaster with a pass the speedy running back took 60 yards for a score and avoided mistakes as the Tigers beat the No. 12 Hokies 31-17 in a game that the Tigers had control of seemingly throughout. He also might have reminded some of Deshaun Watson when he kept alive a scoring drive after scrambling left on a play that started at the 5, dodging three Hokies, shaking free from an ankle tackle and eventually turning back upfield at the 23. He zig-zagged back to the 4. 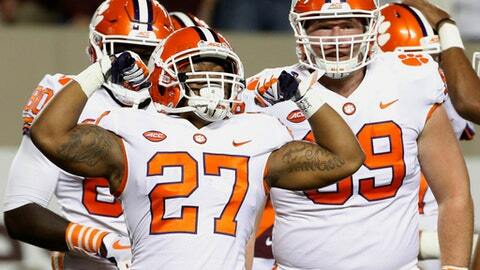 The defending national champion Tigers (5-0, 3-0 Atlantic Coast Conference) have also beaten No. 13 Auburn 14-6 and No. 17 Louisville 47-21 . This triumph was their 12th in a row on the road, and fifth in a row against Virginia Tech, including the 2016 ACC championship. Virginia Tech (4-1, 0-1) never mustered much offense and got its only touchdown after Isaiah Simmons made an ankle tackle on Greg Stroman’s 43-yard punt return to the Tigers 2. Sean Savoy ran it on the next play, but the Hokies had just 234 yards through three quarters. ”We knew the sledding was going to be difficult no matter what they lined up in,” Fuente said. Virginia Tech: Despite playing the Tigers close in last year’s ACC championship, losing 42-35 when they threw an interception from the 23 late in the game, the Hokies didn’t appear quite ready for an opponent that has played in two straight national championship games. Their offensive line got very little push and the Tigers didn’t allow the Hokies’ to get much productivity from their favored short passing game. Hokies leading receiver Cam Phillips caught seven passes for 74 yards and came away most impressed with the Tigers. Clemson is at home against Wake Forest. Virginia Tech heads out on the road against Boston College.